These flavorful zucchini boats have a little surprise tucked inside. Serve them drizzled with marinara over your choice of pasta. 1. Preheat the oven to 375°. Lightly spray a 9 inch square baking dish or individual baking dishes with cooking spray. 2. Cut each zucchini in half, lengthwise, and brush with olive oil. Lightly season with some of the salt and pepper. 3. Heat a large heavy skillet until hot. Place the zucchini cut side down to sear until golden, then remove. 4. Reduce the heat to low and add the remaining oil and the onion. Cook, stirring occasionally until the onion is very soft and beginning to brown, then add the red bell pepper and garlic. Cook until the bell pepper starts to soften. Season with the remaining salt and pepper. 5. In a medium bowl, combine the ricotta, mozzarella, egg, and basil, mixing well. 6. Scoop some flesh out of the center of the zucchini to form a boat, reserving the flesh. Spoon a tablespoon or two of the onion mixture down the center of the zucchini. Divide the cheese mixture between the zucchini, mounding it on top of the onion mixture. 7. Place the stuffed zucchini in the prepared baking dish and add enough water to just cover the bottom. 8. Cover the dish and bake 20 minutes, then uncover and sprinkle on the Parmesan cheese. Bake another 10 minutes, uncovered. 9. While the zucchini is baking, chop the reserved zucchini flesh and add to any remaining onion mixture. Stir in the marinara. Heat the sauce to a simmer. 10. Stir half the sauce into the pasta, then divide the pasta between four plates or the individual baking dishes. 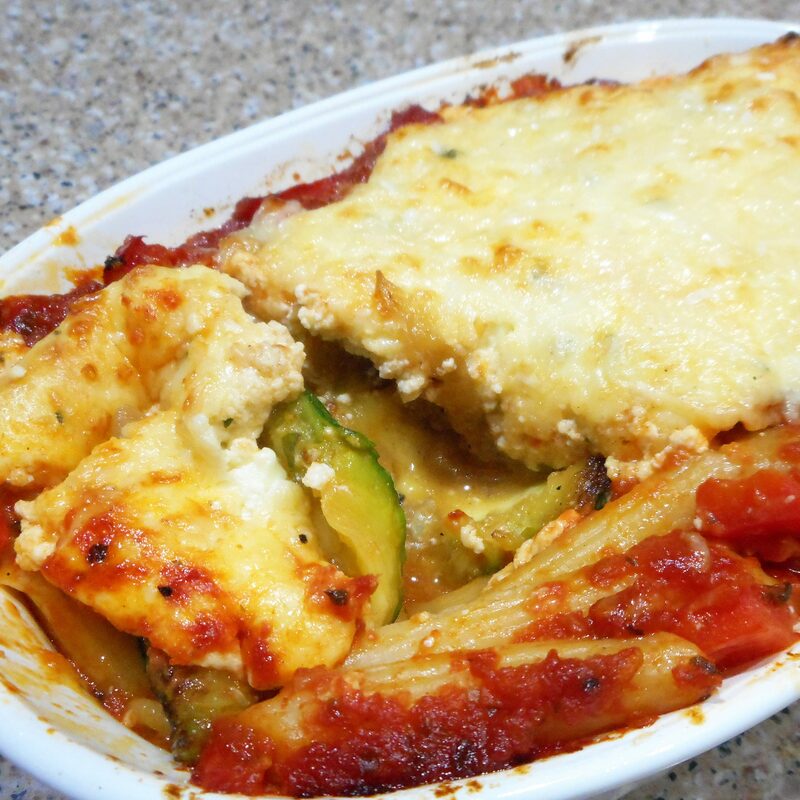 Place the baked zucchini on top of the pasta and spoon on the remaining sauce.